K-State announces the winners for the Heintzelman and Kremer prizes. The Kremer Prize is awarded for outstanding collaborative design achievements by students in the final semester of the professional Master of Architecture program. This year's winning project was "West Bottoms Reborn," conducted in the fifth-year architectural design studio led by Vladimir Krstic, professor of architecture, at the Kansas City Design Center. Join us for a formal reception of the West Bottoms Reborn public exhibition, featuring work by the KCDC urban design studio and West Bottoms Reborn Design Team Artists Miranda Clark, Carmen Moreno, and Jim Woodfill. In addition to the exhibition, project sites will feature temporary public space activation. Light refreshments will be served. Following the reception, there will be a special public performance at sunset (curated by West Bottoms Reborn design team artist Carmen Moreno) titled, Waters Coming: A Ceremony and Ritual in Honor of Our Waters. Waters Coming will feature music and lyric from the Audio Archives; walking tours and sound site destination series - developed and curated by Carmen Moreno. The performance begins at sunset and will end when the sounds dissipate. Attendees will hear from the voices of Jose Faus, Carmen Moreno, Amado Espinoza, Erika Noguera, The St. Mary's Choir of Egypt, and the Allen Chapel AME Choir. Work will soon begin on a portion of the Lewis and Clark Viaduct. Closures for the reconstruction of the I-70 westbound bridge are scheduled to take place on Feb. 2 at 10 p.m. Temporary closures to install traffic control equipment may take place leading up to the two-year westbound closures. • A second lane will be added to the 3rd St./James St. Exit Ramp from I-70. • Temporary signals will be added to two intersections. In preparation for the reconstruction, demolition of the Lewis & Clark Viaduct westbound lanes is tentatively scheduled for early March, a date and time are yet to be determined. The public will be able to watch the demolition on KDOT’s Facebook page at www.facebook.com/KSDOTHQ. While it is not anticipated that traffic control will change once the project begins, please continue to check the Kansas City Metro lane closures on the KDOT website for more details. Work is anticipated to begin on a portion of the Lewis & Clark Viaduct in early 2018 in Kansas City, Kansas. The project will include closure of the I-70 westbound bridge and off-ramps of the viaduct to facilitate reconstruction of the bridge. The letting for this project is anticipated for mid-November. The Lewis and Clark Viaduct is a series of bridges that provide a vital link for I-70 across the Kansas River and connect Kansas City, Kansas and Kansas City, Missouri. KDOT completed a study in December 2012 to examine the condition of each of the nine bridges making up the Viaduct and developed a priority phasing plan for rehabilitation and/or replacement of the existing bridges. The upcoming reconstruction project will replace the existing I-70 westbound bridge structure and provide connections to I-70 to the west, Minnesota Avenue, Washington Boulevard and Fairfax Trafficway. The project partners various government and private entities from across the Kansas City Metro-area, including the Kansas Department of Transportation, the Unified Government of Wyandotte County and Kansas City, Kansas, the Missouri Department of Transportation, KC Scout, the City of Kansas City, Missouri and the Mid-America Regional Council. The total cost of the project is expected to be around $64 million and construction is expected to begin in early 2018. Further information on detours during construction will be provided. Updated daily traffic information for this project and for the entire Kansas City Metro Area can be viewed at: www.ksdot.org/kcmetro/laneclose.asp. Motorists are asked to use extra caution in the work zone area. Please join us for a community conversation on the KCMO CID Green Infrastructure project. Feel free to stop in for donuts and coffee and hear about the project in your area. The West Bottoms' place in our region's history and development is truly unique and began with trading among Native Americans and the French. Originally known as Kawsmouth, and later the French Bottoms, the area's central location has always been essential to the growth and development of the entire Region. During Heritage Week events, we will partner with businesses, agencies and local governments to shed light on the history of the West Bottoms, including the historical sites, businesses, institutions and individuals who have made notable contributions to the community. Our goal is to remind residents of the region of the great times, challenges and potential in the West Bottoms and to re-introduce, and introduce, our area to residents and tourists. We again look forward to presenting the 2017 Heritage Week and ask for your support and as we highlight history and our promising future in "the best part of town." The Riverfront Heritage Trail basic construction which began in 1998 was completed in 2016. A 15 mile trail was never intended to be an area-wide trail system. In the process of completing this trail major urban and topological challenges had to be conquered such as crossing two rivers, scaling major bluffs, and negotiating multiple highways, railroads, and levees. The ultimate purpose was to help make all future trail construction less expensive and more efficient. Arguably, this award winning Trail is the very heart of the entire metropolitan trail system. The Office of Culture and Creative Services is one of the recipients for an award of $100,000 for the "West Bottoms Reborn: Activating Public Space through the Arts" project, a "place-keeping" strategy that integrates local artists and design professionals in the visioning and planning process of public space to extol and nurture the unique qualities of the West Bottoms. West Bottoms Reborn is a partnership between the City of Kansas City, Missouri, Historic West Bottoms, Kansas City Design Center, Unified Government of Wyandotte County and the creative community. The OCCS will use the grant to begin a collaborative process involving artists, community stakeholders, and city departments and policy-makers to address infrastructure and public space needs through arts-based strategies, to facilitate the design and production of art in public spaces, and shape policy that maintains the viability of artistic production in the West Bottoms as it enters a phase of dynamic growth. West Bottoms Reborn will consist of several activities over a two year period, building upon the KCDC West Bottoms Vision Study to study identify the potential for increased use of public spaces in both Missouri and Kansas: (1) the selection of three project sites to be developed into public spaces, with the potential to integrate arts strategies into existing city infrastructure projects, (2) the exploration of conceptual and programmatic scenarios for the deployment of arts for each individual site across all media, and (3) design development and implementation of support infrastructure and art installation on these sites. Artistic and community engagement are integral parts of each activity. Activity and commerce have defined the West Bottoms since before the surrounding city existed. Originally known as the �French Bottoms,� French fur trappers developed the land at the convergence of the Kansas and Missouri Rivers in the 18th and early 19th centuries. They set up semi-permanent residences on the land as they traded with Kansas Indians. With the advent of steam power, the West Bottoms became one of the busiest receiving ports in the Midwest. Steamboats traveled upstream on the Missouri River and offloaded goods and supplies for those traveling westward or trading with Mexico along the Santa Fe Trail system. Credit Card Skimming is Everywhere - Even Kansas City! Please pay attention for a possible scams at the ATM or gas pump. The screaming Eagle restaurant (old Woodswether) is opening the week of April 18th and Bill's Stockyards Brewery is opening the week of April 25th. Historic West Bottoms, whose mission is to promote and advocate for public and private improvements for the welfare of business and industry in this historic location, will focus on regional history and culture in a weeklong celebration during our second annual West Bottoms Heritage Week held April 24-30, 2016. Woodswether public update meeting presentation. 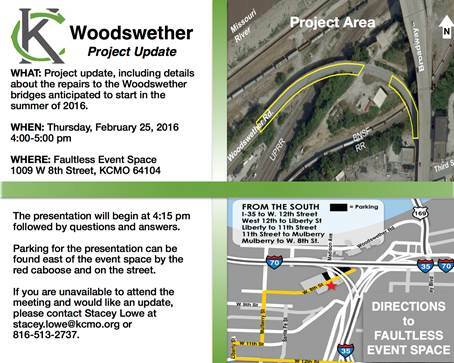 Please join us for a Woodswether Road Project Update on Thursday, February 25th from 4:00 pm - 5:00 pm at Faultless Event Space. Developer interest in the re-emergence of Kansas City's West Bottoms is continuing with a contract for the purchase of a six-building property. An Ohio-based developer that specializes in the adaptive reuse of historic buildings has placed under contract the former Abernathy Furniture Co. compound southwest of Ninth and Liberty streets. After years of false starts, we may be witnessing the long-awaited rise of the West Bottoms. Really. It starts with three developers planning big projects - residential, an arts district, renovation, new construction - and gets a boost from the rich supply of ready-to-restore (often bargain-priced) buildings. Please take some time to read through the 2015 PIAC Funding request for HWB Lighting. Kansas City has issued a nationwide request for proposals to entities interested in repurposing Kemper Arena. The Historic West Bottoms is pleased that the City is moving forward to consider all options. Peak Auctioneering, located in the Historic West Bottoms, has mixed merchandise pallets from Amazon, Lowes and Home Depot to be sold by pallet lot and individually. The auction will be held on Saturday, July 12, 2014 at 9:00 a.m. Click here for full details! An informative learning session for the business owner or manager on preparation of individualized emergency plans for high water events will be held at cfm Distributors, Inc. at 1104 Union Avenue at 2:30-4:00 PM on July 2, 2014.
Business owners or managers employ a wide variety of safeguards, infrastructure, insurance products, training, planning, and other risk management strategies to ensure the continuity of their business operations. An important aspect of this planning should be dedicated to analysis and pre-planning to manage risks and associated countermeasures due to high water events. There are a wide variety of publicly available information resources that can help facilitate both the planning and the execution of the plan in the event of a threat, but only if you take the time to develop your plan ahead of time. On July 2nd, Tom Roberts will facilitate a workshop on this aspect of a comprehensive risk management plan at 2:30 - 4:00 PM at cfm Distributors, Inc. at 1104 Union Avenue. You will learn to develop the timeline and planning elements so that you can add this completed plan to your portfolio of risk management strategies. Beginners are encouraged to attend. There is no cost for this workshop. As discussed at the membership luncheon on Monday, Chem-trol was selected to provide weed control services to the Historic West Bottoms. Chem-trol has provided these services to us for the past ten (10) years and has also been able to deliver these services to individual companies in the West Bottoms looking to improve curb appeal or remove blight. If you are interested in having your property cleared of vegetation and/or weeds, please contact Tonya Reed at 913.342.3006 or 800.844.1156. If you have any general questions about the services provided to the Historic West Bottoms, please contact Chris Boland by email at chrisb@thequalityroofingco.com. Kansas Cities' Levee System provides flood risk management benefits to thousands throughout the Kansas City metropolitan area. To learn what’s being done to protect this asset, click the link below to follow the story. The Child Protection Center (CPC) is excited to bring to Kansas City its 1st Annual Cook for Courage! On Sunday, May 18, 2014, local renowned chefs will compete in a barbecue cook-off to prepare the best smoked ribs! Patrons are invited to come for a fun, engaging and delicious time while enjoying music from Chad Abernathy! Each guest will have the chance to sample both the ribs and a side dish from each chef. Patrons, along with a celebrity panel of judges including, former Kansas City Chiefs quarterback Trent Green, CEO of Sporting Club, Robb Heineman, food writer and photographer Bonjwing Lee, and owner of The Roasterie, Danny O'Neill, will have the opportunity to vote on their favorite ribs and side dish. Patrons will also enjoy a signature cocktail by renowned Kansas City mixologist Ryan Maybee of Manifesto and The Rieger Hotel Grill & Exchange, with bourbon provided by Dark Horse Distillery, and the most exquisite air-roasted coffee by The Roasterie while enjoying the ambiance of the Historic 12th Street Bridge in the West Bottoms! The VIP Pre-Party will take place from 5:00 - 6:00 p.m. The Main Event will take place from 6:00 - 8:30 p.m.
Visit the website or click here to buy tickets today! A Collaborative effort is being made to create a map of the West Bottoms to identify access into the area, along with the east/west and north bound connectors that extend through the various districts. West Bottoms businesses will also be identified on this map. Initially, it is intended that this map provide guidance to those within and outside the Bottoms and assist the Wayfinding/Streetscape committee in its study and recommendations as they work with the City in formulating a plan for the area. Input has been requested from the Unified Government of Kansas City, Kansas and other governmental agencies, but HWB would like to have the map to be a clear representation of the area and the businesses located here. We would appreciate any information regarding current businesses and landmarks that could be included on the map. Please take a few moments to look at these maps and respond with any comments or suggestions to bcriman@kcportauthority.com. The Historic West Bottoms greatly appreciates the talents and efforts of Lynn Carlton and Tim McDonnell of 360 Architecture in initiating this dynamic mapping project. The Public Improvements Advisory Committee (PIAC) consists of two people from each of Kansas City's six districts and a chair person. The primary function of PIAC is to solicit resident input and make recommendations for capital improvement projects for the City and its neighborhoods. One source of public input is from the Downtown Council's Implementation Committee which takes recommendations from its sub-committees (i.e. Infrastructure, Parking & Transportation and Green Space) which meet monthly. Many of the larger City projects such as the Streetcar project use "In-District" funds as well as City wide funds. The budget for In-District funding is approximately 3.3 Million Dollars (as an example, $360,000 of In-District funds will likely be committed to the ongoing Streetcar project for 2015). After considering the multiyear project commitments, the remaining In-District and Citywide funds will be made toward projects that are catalysts to development, focus on connectivity of neighborhoods and neighborhood improvements. It is important for requests to be made and for the champions of recommended projects to attend public hearings. The deadline to submit a PIAC Application for 2015 is August 31, 2014. Projects can be submitted via one of the DTC sub- committees, through the City Manager's Office website or via a PIAC representative. The PIAC representatives for the 4th District, where the Historic West Bottoms is located, are Greg Corwin (816-308-6795) and Jim MacDonald (816-210-7133). The PIAC committee is expected to submit its recommendations to the City in early February of 2015 for the City's fiscal year which begins in May. For more information about past PIAC projects, click the link below (the link is the PIAC projects for 2014) . Contact Scott Brown, sbrown@faultless.com, for information on Historic West Bottoms PIAC projects anticipated in 2015. Please see the announcement from Missouri Enterprise regarding the one-day Buy America Transit Supply Chain Connectivity Forum. My name is Bill Flynt and I had the pleasure of meeting some of you at the January membership luncheon. Many of you expressed interest in our Supply Chain Integration initiative for Kansas City, and as promised I’ve attached the two surveys. This initiative supports a federal program assessing how small businesses can be integrated as vendors into the supply chains of larger businesses and the federal government. Our tasks are to help small businesses integrate into major corporate and government supply chains, as well as help big businesses and government find the small business vendors they need. The attached surveys (one for small businesses, the other for large businesses and government) helps us understand your firm’s capabilities and requirements, so we can match your firm with others that may fit. The survey only takes about 5-10 minutes to complete. If you want, please provide your thoughts on a specific project you’d like to undertake that would help you build your business or supply chain. We’d be happy to discuss your ideas with you and assist in developing your project’s concept. You can contact me at Bill.Flynt@FlyntGroup.com or at 816.243.0044. The Historic West Bottoms (HWB) will again purchase a table at the Annual KCIC Brick By Brick event, held on Wednesday, April 2, 2014; details listed below. We are asking that you HWB members to attend and offset this expenditure by buying at least one seats for $50.00 (we have a table of 10 seats). If we get requests for more than 10 seats, additional seats can be purchased at $50.00 each. Please support the HWB and KCIC, of which we are a member, at this event. Sponsorship opportunities are available. For information, please click here. Thank you for the opportunity to discuss The Ship Tavern project at the March Membership Meeting. I’m writing this letter to review our discussion of your members’ concerns about our proposed new tavern, The Ship. Click here to view a separate information sheet PDF file with a better description of our planned establishment and some photos. First, KCMO Regulated Industries (liquor control) will not issue a 3am license to any new application until they’ve been in business for 12 months and meet a minimum gross sales requirement (If I recall correctly, it’s $250,000 per year). During this “probationary” period, the required closing time will be 1:30am, which is the same for standard liquor licenses. This is so our new business can establish a good track record with city authorities and the neighborhood. Second, the reason we would like a 3am-closing license: I currently work at a tavern in Westport (Chez Charlie Lounge at 3809 Broadway) with a 1:30am-closing license and things get pretty hectic between 1:15am and 1:30am while our staff gets everyone herded out the door. The reason is because if a city investigator walks in at 1:31am and we have someone waiting for a taxi or loading out some equipment, we risk up to a three-day suspension. If we had a 3am-closing license, we’d have a little more breathing room to allow our customers and our entertainers to safely leave. In conclusion, we hope that you and your members will take a minute to review the letter and our information sheet. If there are any further questions or concerns, please do not hesitate to give me a call. We’re very much looking forward to establishing a safe and entertaining venue in the neighborhood and our every intention is to become known as a good neighbor and a responsible operator. I thank you for again for your time. 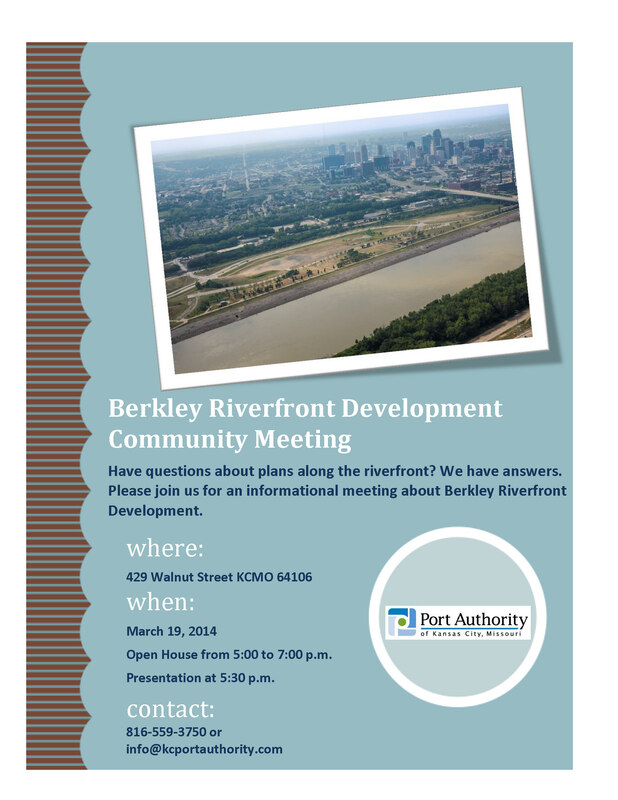 The Port Authority of Kansas City, MO invites you to a community meeting about the Berkley Riverfront Development. Please pass along the invitation to others in your neighborhood and/or organization. Hope to see you there. The Fraud Unit has received information that a Kansas City resident has received numerous phone calls from an individual who has portrayed themselves as a "Deputy from the Kansas City Missouri Police Department." When confronted about their credentials, the caller gets argumentative. The intent of these types of phone calls is to obtain personal information and financial information or money transfers. These calls typically originate from overseas and the caller IDs are manipulated to show *911 on the victims phone. The KCPD does not make these types of calls. If you receive such a call or have received a call of this nature recently, please report to our non-emergency number at 816-234-5111.